The The Ivy Oven is proud to offer you all natural and organic travel inspired baking. While not all ingredients in our food items are organic products, we can absolutely guarantee that we strive to use organic and ethically produced ingredients whenever possible. We take great pride in knowing that every one of our products is made with natural ingredients, from organic free-range eggs and organic all purpose unbleached flour, aluminum-free baking powder, organic oats, organic molasses, organic olive oil, pure vanilla extract, to unsalted butter, organic milk, and fair trade organic cane sugar. We also guarantee there are no artificial, unnatural, or hard-to-pronounce ingredients in any of our products. We hope you will enjoy, and taste the difference, in our back-to-basics baking. I have found inspiration during my travels throughout Canada, the US, Mexico, Cuba, the UK, Holland, Belgium, France, Spain, the Caribbean and throughout Kenya. Each café, bakery, market, rural village and urban city brings new ideas, flavours, and purpose to my baking. In Scotland, I was baking scones for the staff at Stirling University , which inspired me to reinvent my recipe for Scottish Oat Cakes. In France, frequent visits to a bakery near the Champs Elysees for a slice of the perfect lemon loaf, inspired me to add more “zest” to the Ivy Oven’s Lemon Loaf. On Bainbridge Island, in Washington State, I found a wonderful recipe for granola combining nuts, oats and honey, from which our Roasted Island Granola has found its origins. In Kenya, while in the Maasai Mara, and after a long day in the sun, we indulged in the most amazing orange cake made with incredible care and pride by our hosts, which in turn inspired me to create our Classic Orange Cake. I have always believed that food is not simply for consumption; rather the experience of making and enjoying food should serve to enhance your overall well-being. While traveling, I encourage you to visit off-the-beaten-path cafés to gain a better understanding of the neighborhood and its people; and while strolling through the city, I urge you to wander through the local markets to feel the fast-paced pulse of the metropolis around you. At home, friendships are strengthened, and new relationships are formed around food. Wherever you are in the world, whether at home or traveling, always make sure to make and purchase food as natural as possible. Not only will more wholesome food make you feel better, but also your journey finding it will surely make your memories that much better. Why organic, fair trade, all natural, and ethically produced? In pursuit of respecting our environment, and our bodies, I believe natural and organic ingredients are essential to a healthy lifestyle. Why are products healthier and more ethical if they are organic, fair trade, or all natural? Organic free-range eggs, most notably, provide a better life for the chicken who produced the eggs, but also ensure the soil and environment are protected while producing eggs; fair-trade organic cane sugar ensures the farmer receives a fair price for his sugar cane while he practices sustainable – and often more costly – farming practices; unsalted butter is all natural and without added salt; and, organic milk ensures farmers respect the environment, as well as their cows, by practicing sustainable farming to protect soil and water quality for many years to come. Right now fair trade, organic, and all natural products are still much pricier than other products. There are many reasons why more sustainable production tends to cost more, but one of the most significant reasons for the higher price of organic and fair trade foods is consumer demand. We firmly believe that if more people began to demand food without artificial ingredients, genetically modified organisms, harmful byproducts, organic and mindfully produced food will be the only food of the future. All photographs posted on The Ivy Oven web site are original, taken by myself, and or Zuzu photography. 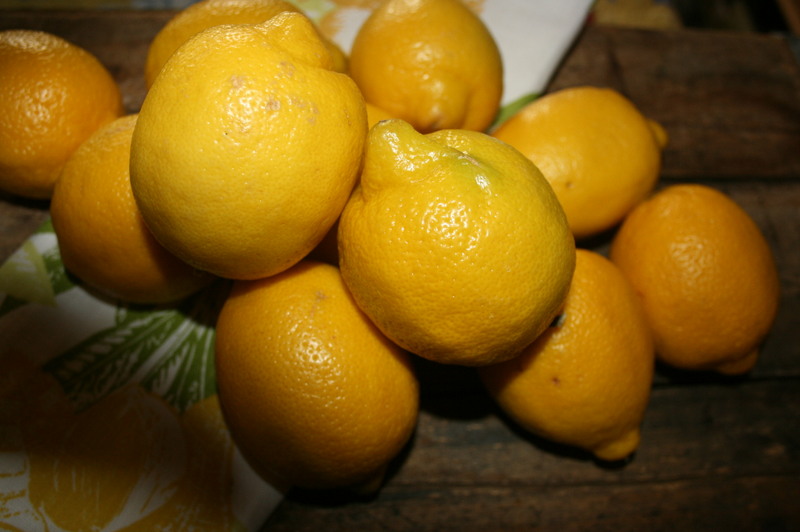 Look for the Lemon Ginger Scones at this coming Wednesday’s Market! Thanks Linda, it was nice to see you at the market! Loved the cheese and dill scones, thanks for sharing your treats at the baker’s market! Lori & Jen, Delighted you have teamed up together.